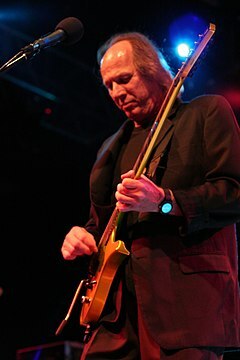 Adrian Belew (born Robert Steven Belew, December 23, 1949) is an American musician, songwriter and record producer. A multi-instrumentalist primarily known as a guitarist and singer, Belew is noted for his unusual, impressionistic approach to guitar playing, which, rather than relying on standard instrumental tones, often resembles sound effects or noises made by animals and machines. On the recommendation of musician/producer Brian Eno, after seeing a Zappa concert in Cologne, Germany, David Bowie offered to hire Belew once the Zappa tour was finished. Belew accepted the offer, as Zappa intended to spend four months editing the film Baby Snakes. Belew then played on Bowie's Isolar II world tour in 1978; he played on the double-live album Stage, and also contributed to Bowie's next album, Lodger. Twelve years later, he returned to working with Bowie, acting as musical director on the 1990 Sound+Vision Tour, while also playing guitar and singing. Despite the disagreements of the time, the members of the 1981–1984 King Crimson maintained enough camaraderie and mutual respect to reunite in 1994 (adding second drummer Pat Mastellotto and Warr guitarist Trey Gunn) with Belew continuing as the band's singer, guitarist, and frontman. The six-piece King Crimson toured successfully and were together until 1997, releasing the THRAK album and several live recordings. From 1997 onward, Belew participated in several of the ProjeKcts, a series of instrumental and experimental King Crimson side projects active during the band's hiatuses, in which he predominantly played electronic drums. Following King Crimson's breakup/entry into hiatus in 1984, Belew formed the pop band The Bears with fellow guitarist and singer Rob Fetters, drummer Chris Arduser, and bass guitarist Bob Nyswonger. All three were close friends of Belew whom he'd met during his Sweetheart days in the mid-1970s, and were also ex-members of The Raisins, a Cincinnati-based band that had some local success in the early 1980s and had an album produced by Belew. In 1990, Belew produced a similar follow-up with Young Lions. This featured a number of cover versions, plus two guest appearances by his past and current employer David Bowie, who'd hired Belew as musical director for his then-current Sound+Vision Tour. The album generated another US Modern rock chart hit (No. 2) with the Belew-and-Bowie duet "Pretty Pink Rose," and a minor hit on the same chart with the subsequent single, "Men In Helicopters" (No. 17). On February 25, 2013, Trent Reznor of the band Nine Inch Nails named Belew the new Nine Inch Nails touring guitarist. Belew was going to perform with the band on a new Nine Inch Nails tour from the summer of 2013 into 2014. On June 7, 2013, Belew posted an update on Facebook stating that "it didn't work." Despite this, Belew was credited as a session musician on the 2013 Nine Inch Nails album Hesitation Marks. On 1/16/19 Belew announced an expansion of his "Power Trio" to a quartet and 2019 tour. Band members are Jordan Perlson on drums, Saul Zonana on keyboards, guitar, and vocals, and bassist Julie Slick. Most recently, Belew has moved into working with mobile app platforms via his self-designed iOS apps FLUX:FX - the professional audio multi-effects app and FLUX by belew™, which contain over three hundred audio tracks and pieces of artwork that he describes as "never playing the same twice." FLUX:FX is a real-time audio manipulation app for the iPad that he said "lets me make sounds that I can't get with any other gear." Both apps have gathered significant industry recognition, including being honored twice in the 2015 Webby Awards and receiving a 'best of the best' at the 2015 Red Dot Design Awards. In 2010, Guitar Geek interviewed Belew's guitar technician André Cholmondeley, creating a list and diagram of Belew's guitar setup at the time. Belew is always adjusting his live setup, and according to audio engineer Daniel Rowland, he is now[when?] running an Axe-FX II, Liquid Foot 12+ controller, Roland VG-99, Kemper profiling amp, a Keeley Compressor pedal, Ableton Live (running on an Apple Macbook), Soundblox Multi-wave distortion, DigiTech HarmonyMan, iConnectMidi 4+, MOTU Ultralite 3 hybrid, Keith Mcmillen Instruments Softstep 2, and his own NOIISE FLUX:FX iPad app through the Bose L1 and Atomic monitoring wedges. Some artists have expressed their admiration for Belew or have cited him as an influence, including Adam Jones of Tool, St. Vincent, Anneke van Giersbergen of The Gathering, Garry Roberts of The Boomtown Rats, William Rees of Mystery Jets, Nick Reinhart of Tera Melos, Josh Christian of Toxik, and Sean Worrell of Nero di Marte. In an interview with Guitar Player magazine in 1994, Trent Reznor would describe Adrian Belew as "the most awesome musician in the world." Belew has also produced and played on albums by three Mexican rock bands: Caifanes's 1992 album, El silencio; Santa Sabina's 1994 album, Símbolos, and Jaguares' 2005 album, Cronicas de un Laberinto. ^ Prato, Greg. "Adrian Belew: Biography". AllMusic. Retrieved 2009-04-22. ^ Brodnitz, Dan (2007-12-28). "An Interview with Adrian Belew, Part 2". about Creativity. Retrieved 2009-04-22. ^ "King Crimson FAQ". Elephant Talk (archived page from elephant-talk.com). Archived from the original on 2005-08-28. Retrieved 2007-08-29. ^ a b c Kelton, Sam (2008-11-27). "Zappa prodigy Adrian Belew still rockin'". Adelaide Now. Archived from the original on 2013-06-12. Retrieved 2009-04-22. ^ "Trent Reznor Announces the Return of Nine Inch Nails: Extensive Touring for 2013 and 2014 | News". Pitchfork. 2013-02-25. Retrieved 2013-06-10. ^ "Adrian Belew - concerning me being part of the 2013 Nine..." Facebook. Retrieved 2013-06-10. ^ "FLUX by belew". Adrian Belew. Retrieved 2015-04-16. ^ "FLUX:FX - the iPad effects app from Adrian Belew". NOIISE. Retrieved 2015-04-16. ^ Beck, Steven (2005). "Guest column: Adrian Belew Interview". Online Rock. Archived from the original on 2008-10-13. Retrieved 2009-04-22. ^ "Electro Harmonix Stereo Polychorus Guitar Effects Pedal". DV247.com. Archived from the original on 17 May 2009. Retrieved 2009-04-22. ^ "Adrian Belew Endorses Parker Guitars". Parker Guitars. 2005-08-18. Archived from the original (Press release) on 2005-12-15. Retrieved 2009-04-22. ^ Angle, Brad (January 15, 2015). "Tool's Adam Jones: My 10 Favorite Guitarists". Guitar World. Retrieved February 20, 2017. People don't bring up Adrian Belew enough, and I think he's just as heavy as Fripp. Adrian plays straight from his heart, so some of his lead structures defy the classical approach to scales and teaching. He's also really into new technology, but he uses it in a very thought-out and tasteful way. ^ Jim (January 20, 2017). "Video: Annie Clark of St. Vincent Talks Gear and Influence at NAMM 2017" (video). Reverb.com. Event occurs at 1:34. Retrieved March 24, 2017. ^ Keefy (29 April 2009). "Uncharted Waters- Anneke van Giersbergen". Ghostcultmag.com. Retrieved 26 February 2017. [...] For instance Adrian Belew and I've followed him since I know him, he worked with Zappa and King Crimson and I listen to all that stuff. I think he's one of the best singers in the genre and of course best guitar players. ^ Fetherstonhaugh, Neil (August 9, 2016). "Bulmers Live at Leopardstown to close with Boomtown Rats". DublinPeople.com. Retrieved February 21, 2017. ^ Ryan, Grace. "artists » William Rees and Blaine Harrison of Mystery Jets". Voxamps.com. Archived from the original on 29 March 2009. Retrieved 25 February 2017. ^ "Guitarist Interview with Nick Reinhart of Tera Melos". QRD. Silbermedia.com. August 2010. Retrieved February 20, 2017. ^ CalvinF (January 19, 2013). "Interview with Josh Christian from TOXIK". Addictedtomoshblog.wordpress.com. Retrieved February 21, 2017. ^ "Interview with Sean Worrell of Nero di Marte". AgoraphobicNews.com. July 29, 2015. Retrieved February 21, 2017. There are several singers I've admired and have listened to since I was a teen… Bjork, Adrian Belew, Mike Patton, are the first that come to mind. ^ "'Piper,' scored by Covington native, wins Oscar". WCPO. 27 February 2017. Retrieved 1 January 2019. ^ Post, Pixar. "Meet 'Piper' - Pixar's Upcoming Short Film by Alan Barillaro". Retrieved 1 January 2019. ^ "N.Y.X - The News (2016)". Progarchives.com. Retrieved 1 January 2019. ^ "Signature Series". Parkerguitars.com. Archived from the original on 2012-03-19. Retrieved 2012-03-25. ^ "Youtube clip Adrian Belew Japanese TV advert". Youtube.com. Retrieved 2012-02-28. "Adrian Belew". Music Technology. March 1987. p. 41. ISSN 0957-6606. OCLC 24835173. 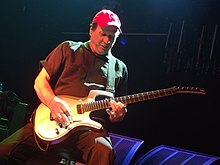 Wikimedia Commons has media related to Adrian Belew.